Ca Mau (VNA) - The Ministry of Agriculture and Rural Development held a conference in Ca Mau province on April 9, seeking measures to combat river and coastal erosion in the Mekong Delta region. According to Vice Chairman of the Ca Mau province People’s Committee Le Van Su, some 7,800 hectares of coastal forest were lost to the sea during 2007-2014, and erosion has become frequent along more than 100 kilometres of coastline. 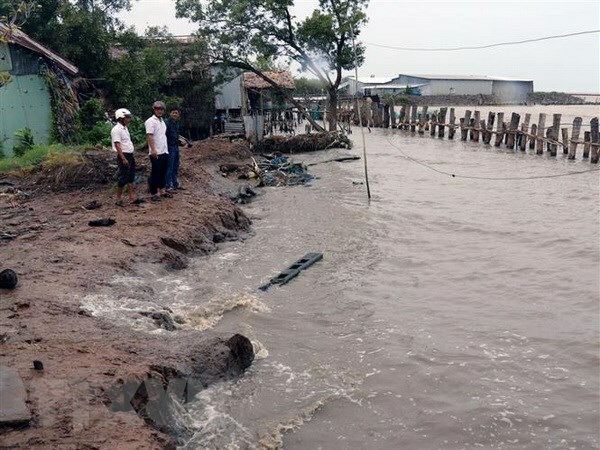 Meanwhile, Vice Director of Dong Thap province’s Department of Agriculture and Rural Development Vo Thanh Ngoan said more than 8,000 households in erosion-prone areas need to be relocated to safer places. However, the locality is struggling to arrange resettlement for them due to land shortages.